What’s new in the current release? Estimate Guide Search Improvements: In this update, 1Search Plus technology from the repair information has been applied to the Estimate Guide module search. As you search within the Estimate Guide module, you’ll notice that the search functionality has been remarkably improved over the previous version. The main benefit is more precise search results with fewer categories to choose from in the Estimate Guide left-side menu. 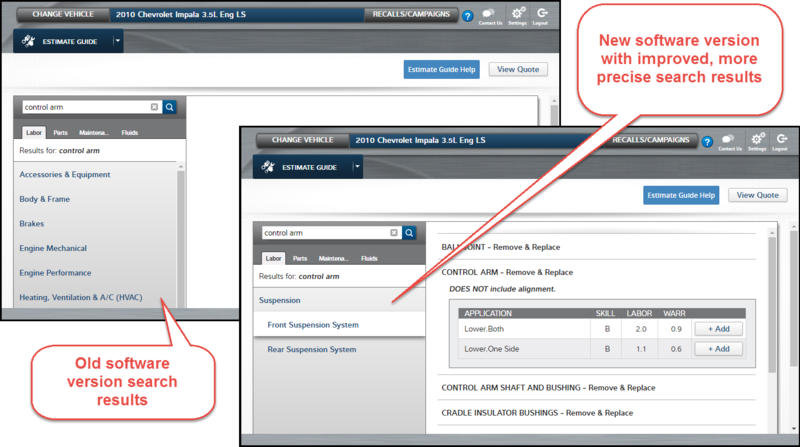 For instance, if you search for “control arm,” you will now be directed to the Suspension system information – see example below. Estimate Guide Help Documents: Along with the updated search function, the documentation for the Estimate Guide has been updated. You will now see a button labeled “Estimate Guide Help” which links to documentation to help you use the Estimate Guide more effectively. This includes our policies and procedures, a guideline for writing an estimate and two sets of frequently asked questions related to our Estimate Guide.